Have you ever returned to a special place and witnessed it with new eyes? I’m sure I’m not alone in this unless you are a hermit crab. No offense hermits out there, but come on. It is healthy to get out of the house, your norm, and experience a new place or even a familiar place again with new eyes. For those that are with me, whether you returned to a city a changed person and/or the place itself had transformed since your last visit, it was most likely a mix of emotions. That’s what happened to me recently. 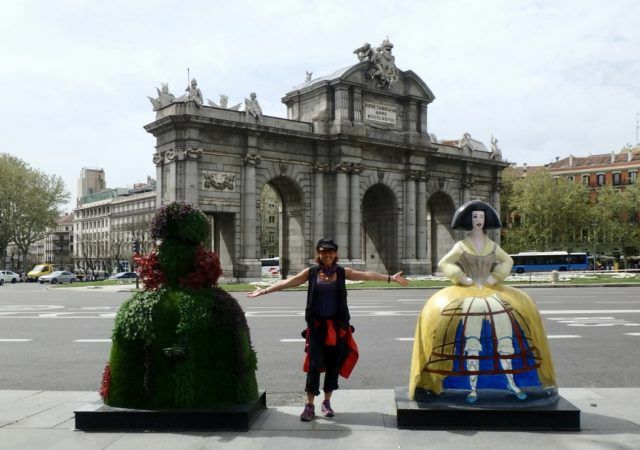 Last month, I returned to Madrid, Spain where I had lived in college for two years. 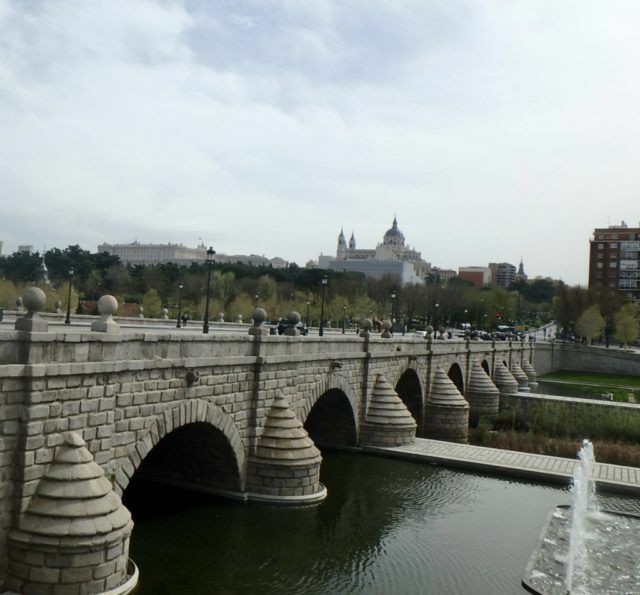 However, a lot of water has gone under the Manzanares Bridge over the last two decades. Thus, I certainly saw Madrid with new eyes. Although many times we want places and people to stay the same, the fact is evolution is necessary. I don’t think I need to explain the Biology 101 topic including, Darwin’s Law, do I? 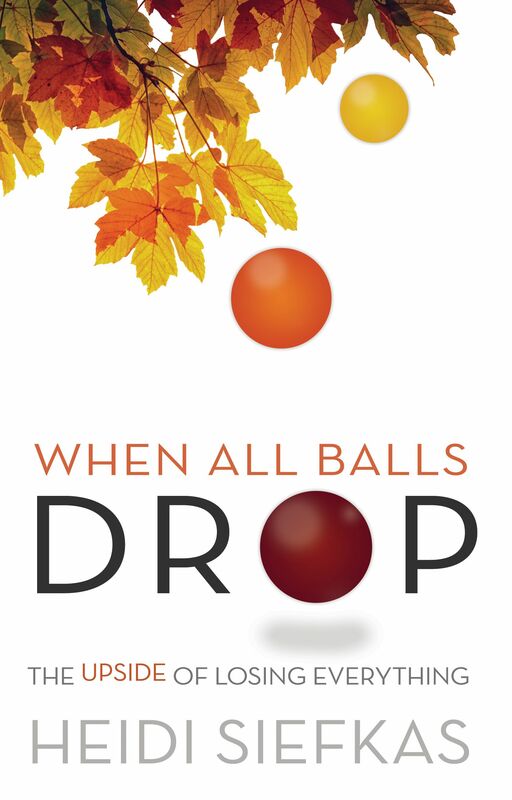 If you need a refresher, check out my TEDx talk. Upon my return visit to Madrid or better-said homecoming, I was pleasantly surprised with three new adventures. Take my advice. When in Madrid, do yourself and your travel buddies a favor by putting these adventures on your must-do list. In Spain, it has always been typical that when you go to a bar or café and order an alcoholic beverage, you would receive a tapa (a small bite). This could be a dish of olives, nuts, or even slice of tortilla española. It was my part-time job in college to know the best tapas bars to go for which tapas and on which nights. With the years, the tapa tradition continues, but most establishments don’t give out tapas for free. Yes, inflation has hit the tapa world. 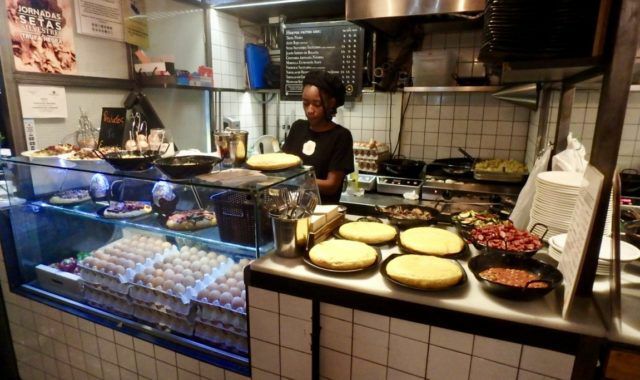 However, most bars, cafes, or taverns have a tapas menu for you to select your snacks at very economical prices. Plus, another change is that you can experience all the best tapas and all under one roof. 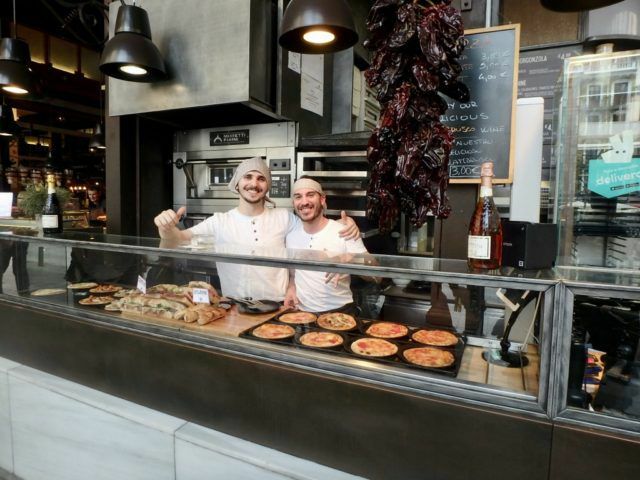 Neighborhood food markets have sprung up in Madrid. 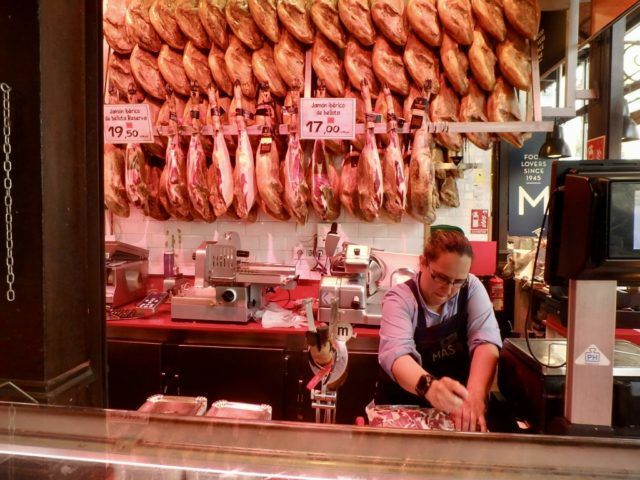 On my last trip of only two days, I frequented four food markets: Mercado de San Miguel, Mercado de San Anton, Mercado de Torrijos, and Mercado de Ildefonso. 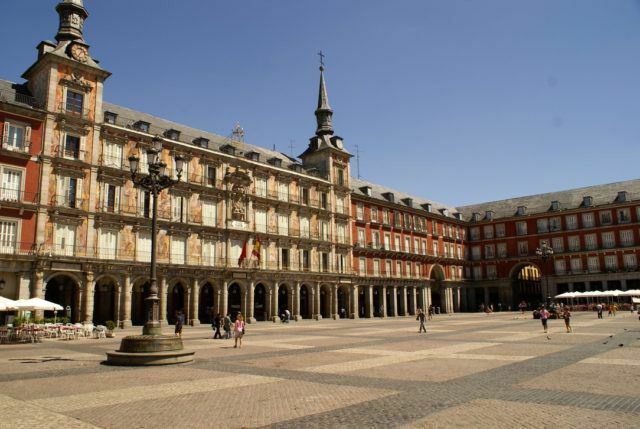 In a densely populated, European city like Madrid, how can you add more entertainment venues, restaurants, and bars and close to the historical city center or places of interest? 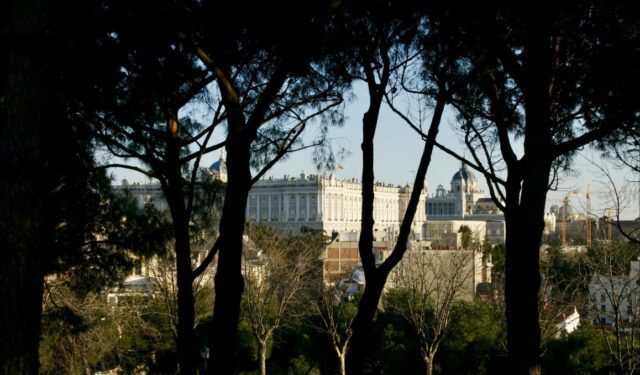 Like other cities, Madrid found a pleasant solution by going to the rooftops. On my whirlwind revisit of Madrid, I enjoyed two rooftop settings. 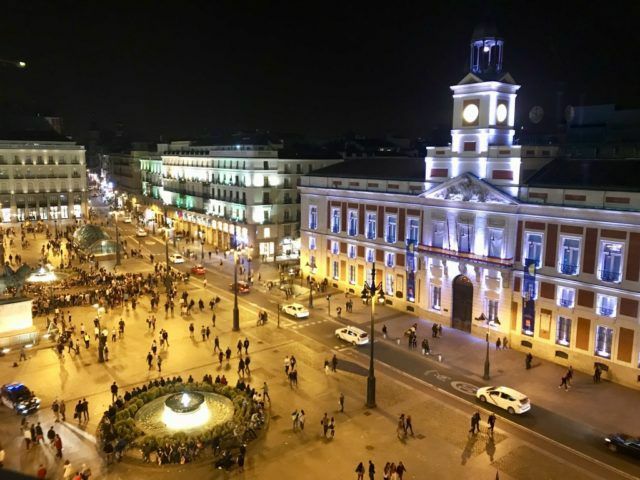 One was where I used to study, the Azotea of Círculo Bellas Artes, and the other was at Taberna Puerta del Sol (view pictured above from the 5th floor of the Cortes Inglés). 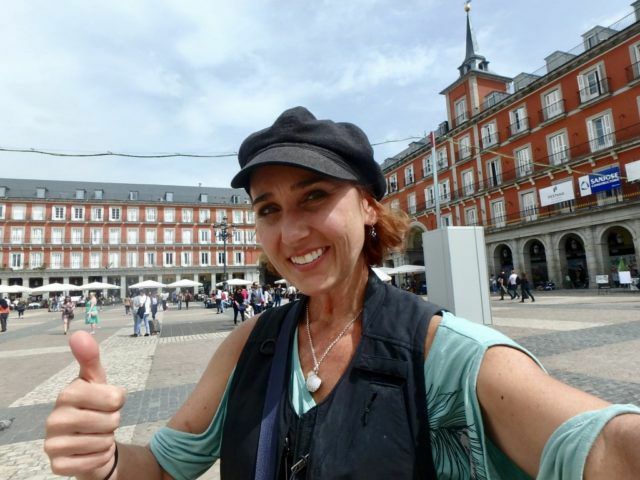 Although I’m a fan of walking in a city, on this particular quick trip, I wanted to experience some of the changes of Madrid while taking care of my sore feet. 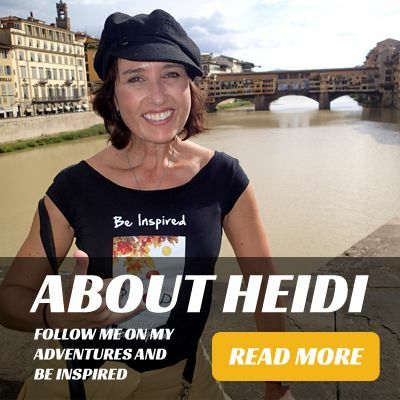 I had just completed the Camino de Santiago. Needless to say, I wanted to pedal to cover more ground. In my college years, I don’t remember many Madrileños that owned nor used bikes. Only because I lived near the Retiro Park did I notice some riders within the park, but very seldom on the streets. However, on this particular visit, I noticed bike lanes, rental touring bikes, and Bravo Bike Tours. On my first morning back to Madrid, I hopped the Metro to Bravo Bike Tours’ office. 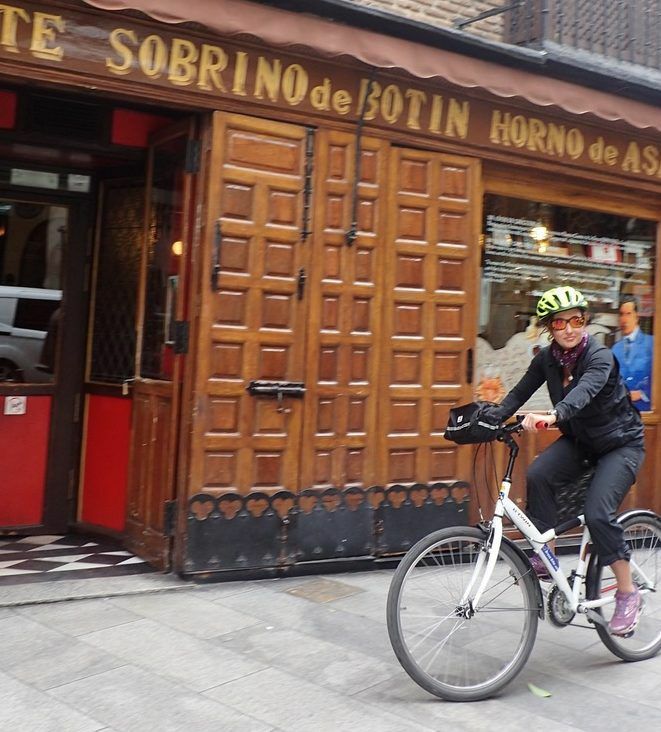 While getting my fellow bikers set with the right sized bikes and helmets, I chatted with the CEO and Founder, Kaspar Winteler, about my time in Madrid and just completing the Camino on foot. He was no stranger to the Camino. He had done it on bike countless times. After doing my first Camino, I can understand why 30% of people do it via bike. Following our guide, Anthony, our small group of bikers from Canada, Italy, Israel, and the US, set out for three-hours of fun. We wound our way from the office to the Royal Palace’s gardens where we spotted beautiful flowers in bloom, statues, and even a few peacocks. After a few miles of biking, Anthony stopped at a local watering hole to allow all of us to have a café con leche, caña (small draft beer), or a tapa before we headed to the Manzanares River Park. 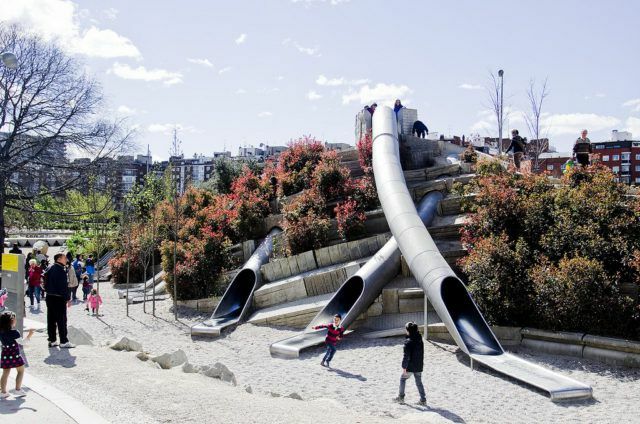 Created as an ecological boulevard, this city park has slides and ziplines for entertainment as well as various cycling paths. This park didn’t exist when I lived in Madrid. I wish it had. Seeing my smile, Anthony asked, “You want to slide?” I quickly left my bike and took turns with kids nearly a quarter of my age. He didn’t even need to ask when we arrived at the longest zipline. Weeeee, I was off. 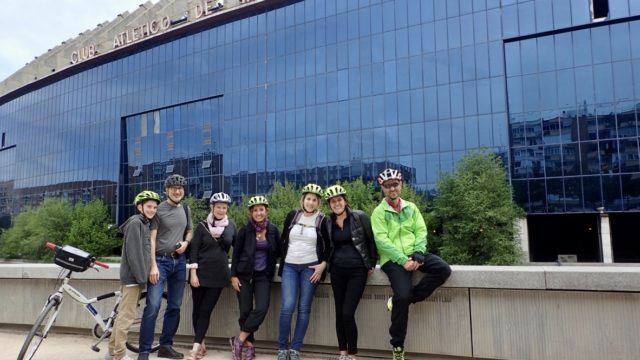 After our recess from the tour, we resumed the ride passing the Reina Sofia Museum with Picasso’s Guernica and the Atocha train station, pedaling our way through cute side streets like Calle Huertas to the Plaza de Santa Ana, a literary center of the city. 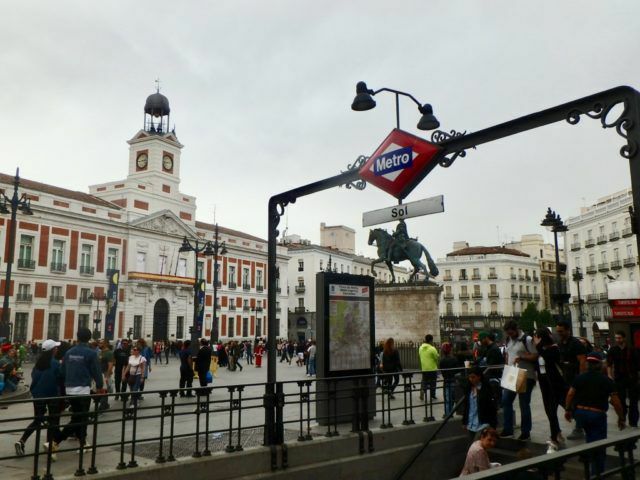 We avoided busy Puerta del Sol by taking the back way to Plaza Mayor and then continued towards the Opera House and the Royal Palace. Our entire route is shown below. 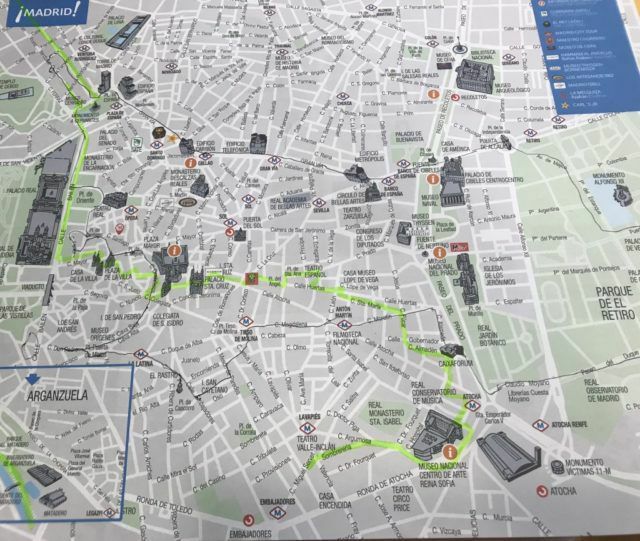 I was shocked that we had covered nearly fifteen miles, showing me another side of Madrid, places I had never seen and other places from a different vantage point and with different people. Gracias Bravo Bike, Kasper, and Anthony for a wonderful new adventure in Madrid! 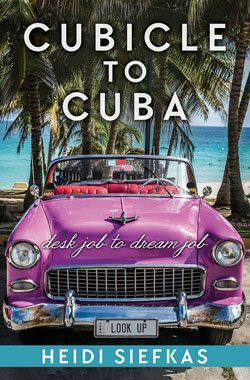 Just as I witnessed Madrid with new eyes, I returned to South Florida seeing home through a new lens and appreciation. Maybe I should try to live like a tourist close to home as an experiment to see if I get the same beneficial side effects. That’s exactly what I did.